The City of Rocklin has a long history, but much of the growth has been within the last 30 years. Rocklin was first recognized as a destination along the transcontinental railroad in 1864, about the same time granite mining began. 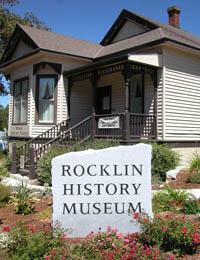 Rocklin was incorporated in 1893 during the heyday of railroad and granite mining activity. By 1910, 22 quarries operated in Rocklin and, in 1912, nearly 2,000 train carloads of granite were sent out of town to become part of the state capitol building and buildings in San Francisco. North of Rocklin’s core was Spring Valley Ranch, founded in 1855 by the Whitney family. Whitney’s ranch included sheep and a wide variety of agricultural products. Over the years, 25 miles of crushed stone roads, 12 granite bridges, stables, barns, and housing for 200 ranch hands and their families were all constructed on this sprawling 30,000 acres, now considered the first developed property in Rocklin. Whitney’s ranch was eventually subdivided and sold off to various development interests as the expansion of suburban communities from Sacramento to the northeast led to the growth of the housing market in Rocklin during the late 1950s and early 1960s. This resulted in the development of the Sunset Whitney neighborhood, centered around a beautiful golf course. Beginning in the 1980s, Rocklin realized the benefits of a lower cost of living and land that drew high technology firms and other industries to the region. This resulted in an expansion of commercial and residential development, including Stanford Ranch, the 3,000 acre master planned community that had also been part of Spring Valley Ranch. A steady period of growth continued in Rocklin with additional master plan areas including Whitney Oaks (1,000 acres) and Whitney Ranch (1,300 acres). As Rocklin has evolved, the City has saved many of the original granite bridges used to cross creeks on the Spring Valley Ranch and has designed parks to include these bridges. Rocklin is now nearing the end of its growth phase. With few remaining large, undeveloped parcels and no opportunities for annexation, City leaders are shifting their focus from one of growth to long‐term sustainability. Rocklin must ensure that the City’s high quality of life can be sustained in the years to come. This shift in focus requires new thinking, new ways of doing things but also provides for new opportunities. Part of the City’s long‐term model for sustainability is to look back on where it all began: the City’s core. Downtown and Historic Rocklin are ripe with opportunities for redevelopment. Quarries still dot the landscape, providing a unique asset for new community, park and recreational uses. Take a visual tour with maps & photos of our historic sites, here. The historic sites tour was created to showcase historic landmarks in Rocklin's Quarry District.